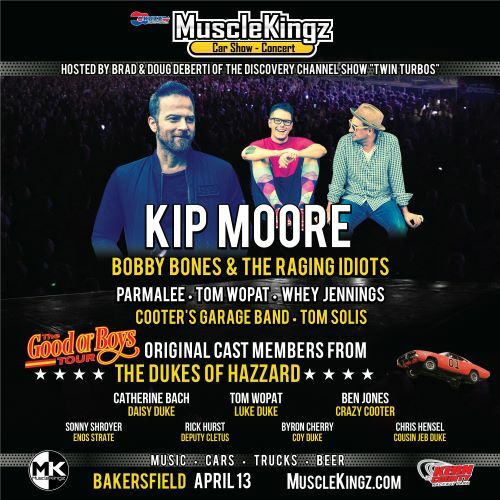 Kip Moore, Bobby Bones and the Raging Idiots, Parmalee, Tom Wopat, Whey Jennings and cast members from The Dukes of Hazzard to Appear at MuscleKingz Car Show & Concert on April 13 | 2911 Enterprises, Inc.
BAKERSFIELD, Calif. – MuscleKingz will transform the Kern County Raceway on Saturday, April 13 into the biggest car show and concert extravaganza to ever hit Bakersfield! This event will feature a day of live music headlined by multi-PLATINUM singer/songwriter Kip Moore, known for his high-energy sets that have made him “one of country music’s most tireless and powerful live draws” (Rolling Stone). Additionally, multi-media personality Bobby Bones who recently won Season 27 of ABC’s Dancing with the Stars and has returned to the latest season of ABC’s American Idol as the official in-house mentor, will take the stage with his band The Raging Idiots. Also performing on the MuscleKingz KUZZ Stage include Parmalee, Tom Wopat, Whey Jennings, Cooter’s Garage Band and Tom Solis. General Admission tickets, VIP Tickets and reserved seats for the MuscleKingz Car Show & Concert are on sale now at www.MuscleKingz.com. The car show will feature hundreds of classic and modern American muscle cars, custom trucks, hot rods, rat rods and more. Aside from music and car show, the event will also celebrate the 40th Anniversary of The Dukes of Hazzard, a family friendly day of activities including autograph signings and photos ops with the original Dukes of Hazzard cast including Tom Wopat (Luke Duke), Catherine Bach (Daisy Duke), Ben Jones (Crazy Cooter), Rick Hurst (Deputy Cletus), Sonny Shroyer (Enos Strate), Chris Hensel (Cousin Jeb Duke) and Byron Cherry (Coy Duke) as well as a chance to take photos with the last surviving legendary 1969 Dodge Charger – “General Lee” R/T 440 – owned by Chrome Cars and used in the original filming of the Dukes of Hazzard TV series. Entertainment for everyone throughout the day with drifting demos from Brad Deberti and his 1000 horsepower drift truck, Blake Wilkey and his 750hp Megalodon bug, motorcycle stunt show from Jimmy Burnouts, hooligan flat track motorcycle racing with the Hooligan Dirt Dash presented by Law Tigers with bar banging motorcycle racing action. Cooter’s Place will have a pop up shop featuring Dukes of Hazzard memorabilia available for purchase. MovoCash is giving away $5,000 throughout the day at their booth, letting fans “Spin to Win” for their chance to win cash that can be spent immediately! Three Way Chevrolet will have a massive display of new and classic high performance Chevy vehicles for the fans to check out. Keystone Automotive will have display of vehicles and products, Renegade products will be onsite giving away free product to all pre-registered drivers! Their experts will be onsite doing live product demos and providing information to show goers about how to best treat their vehicles. Coors Light – Official Beer of Bakersfield MuscleKingz Car Show & Concert – will be refreshing fans all day with ice cold beer and everyone can enjoy a showcase of area food trucks with delicious food for purchase. The MuscleKingz Car Show & Concert will be hosted by Brad Deberti, who was born and raised in Bakersfield, and co hosted by his father Doug Deberti who together entertain fans on their Discovery Channel TV show ‘Twin Turbos’. They build outrageous state-of-the-art cars and trucks and each have won multiple SEMA Best of Show Awards. Brad is currently NASCAR’s State Rookie of the Year. The Fab School created the custom awards trophies built by their students inspired by the high performance vehicles they are being awarded to! Limited space to show your car or truck is still available with online registration which closes at 11:59pm on Wednesday, April 10 or when space sells out. To register your car or truck, get your tickets and all information about the Muscle Kingz Car Show & Concert at the Kern County Raceway on Saturday, April 13 visit www.musclekingz.com. The MuscleKingz Car Show & Concert is made possible through the support of sponsors including Coors Light, Renegade Products, Three Way Chevrolet, Cooter’s Place, Proformance Diesel, illumiCraze, Keystone, Movo, WAT Distributing, Three Way Chevrolet, Law Tigers, The Fab School, Full Throttle Battery, Dapper Lighting, Keep The B**** Floored, City Roots in Boots, Born Vintage Hot Rods, LBZ, Dirty Business Co, State Farm, AT&T, 4 Wheel Parts, Silver Wolf Entertainment, Active Lifestyle and Pep Boys. Tickets for the MuscleKingz Car Show & Concert are on sale now at www.MuscleKingz.com. VIP tickets and reserved seats are also available. FREE for children 5 and under, discounted tickets for 6-12 with paid adult admission. To purchase tickets, visit musclekingz.com or call 888-512-7469. For father-son duo Doug and Brad DeBerti, custom car building isn’t just a hobby, it’s their life. From creating a truck modeled after a fighter jet to developing the first ever drift racing truck, the DeBerti’s have been building one-of-a-kind cars and trucks for more than two decades, winning over twenty awards, and turning the family business into a household name. Watch them on Discovery Channel’s TV show TWIN TURBOS creating outrageous, state-of-the-art builds – pushing the boundaries being featured SEMA, the largest car event in the world! See them host the MuscleKingz Car Show & Concert on April 13 at the Kern County Raceway. Brad will be exhibiting and showcasing his favorite builds for all to see and enjoy the true craftsmanship and fabrication they took to create! For more information, visit deberti.com. Three-Way Chevrolet commitment to providing Bakersfield and Kern County customers exceptional service and the best selection of Chevrolet cars, trucks and SUVs, has helped the dealership achieve recognition as one of the nation’s top automotive dealers. Three-Way Chevrolet has over 200 dedicated employees striving to provide each customer with superior service and value. Meeting the needs of each customer with personalized service has created families of repeat customers that span generations. Fostering community ideals and providing jobs in a pleasant and modern facility has been the goal at Three-Way Chevrolet for the past 50 years. We invite everyone to stop by and visit our automotive professionals today! Renegade Products manufactures the highest quality products and tools for automobile detailing and high-speed metal polishing. Our products are formulated to perform and tested by professionals for better and longer lasting results. Renegade Products delivers promising results to your automobile, truck, and any other vehicle that needs detailing, polishing, and restoration.